Vauxhall has sent its Meriva model to the great scrapyard in the sky, and has ushered in the new Crossland X instead. At its media launch this week, I drove this fresh Vauxhall model with the 1.2 turbo petrol powerplant. The car is sexier than the Meriva – but that’s not a hard thing to achieve – and it’s targeted primarily at young families, as well as the older car buying public. The Griffin-badged automaker claims the Crossland X is an important piece of the jigsaw within Vauxhall’s bigger picture. This is not a 4×4, like the new Mokka X. Instead, it is a more functional motor, with schools and supermarkets likely to be among its most popular destinations. The Crossland X is the first set-of-wheels to come after the takeover of Vauxhall by PSA Group, the owner of Peugeot and Citroen. Therefore, it shouldn’t surprise you to learn that the car is mounted on a similar platform to the Peugeot 2008, using a related assortment of transmissions and engines, but with a distinctive body and a different interior. Step inside the cabin and the Crossland X doesn’t disappoint. Big windows mean natural light washes into the car, creating a positive and happy atmosphere. And, from a practical point of view, space is excellent in the front, while occupants in the rear, although not benefitting from as much legroom, have generous headroom. This means two six-footers can fit in the rear easily, or you can get three small kids next to each other on boosters. What’s more, the two outer rear seats are fitted with Isofix, allowing you to anchor in full-sized child-seats if you prefer. 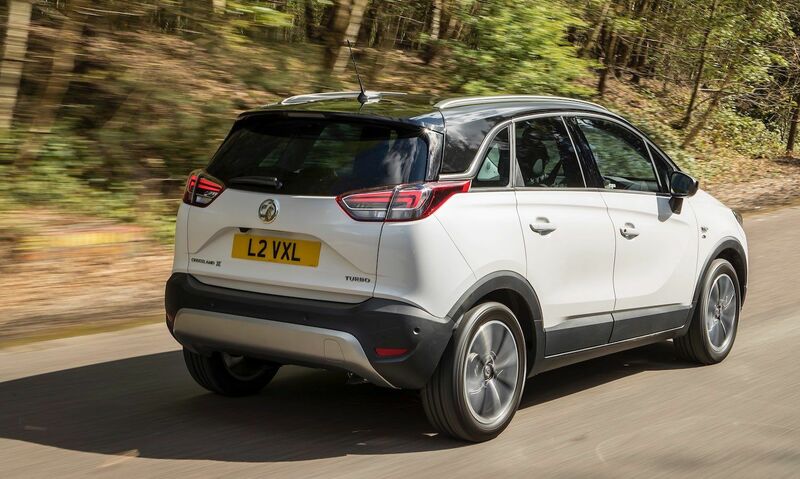 The Crossland X comes factory-fitted with a 410-litre boot, which is bigger than its Mokka X sibling’s load bay. Furthermore, the Vauxhall has copious areas to store odds and ends around the cabin, including conveniently large door pockets. Other basic kit comprises a foldable armrest for the driver and twin USB slots. The Crossland X also has an easy-to-read colour infotainment screen, which will hook up to your mobile phone, allowing you to access Android Auto and Apple CarPlay. Other standard kit includes little luxuries, such as cruise control, climate control, LED running lights and alloy wheels. If that’s not enough, you get a camera at the front of the Crossland X which recognises traffic signs and detects if you’re departing from your driving lane. An annoying beeping sound goes off if you do wander over a white line, but you can turn this off with a press of a button, if you wish. My car came in Elite guise, so it was jam-packed with other furnishings and equipment, like tinted glass, digital dials, chrome and larger alloys. While the cabin is well shaped and quite Astra-like, some of the materials are a little scratchy. However, the design is fetching and far better than the outgoing Meriva and prettier than the Mokka’s. On the road, the Crossland X’s overall drive is good. It rides well over our patchy road surfaces and seems to cope without too much body roll in bends. The thing that rains on its parade is the gearbox’s long throw. While the actual changes are smooth, first and third feel miles away. The steering isn’t sports-car precise, but it’s not lifeless either and is easy to steer around town. It also makes light work of parking in tight spots. The flagship 130ps 1.2-litre three-pot turbo petrol unit, tested here, has a satisfying punch to it when you stamp on the gas, resulting in a 9.1 zero to 62mph sprint, and a maximum speed of 128mph. The car is hushed, even when travelling at a fair old lick, with very little tyre-roar or wind-whistle entering the cabin. Perhaps more importantly than out-and-out performance figures, the Crossland X, fitted with the 1.2 turbo petrol, will do up to 55.4mpg on average. Emissions are pleasing at 116g/km, too.